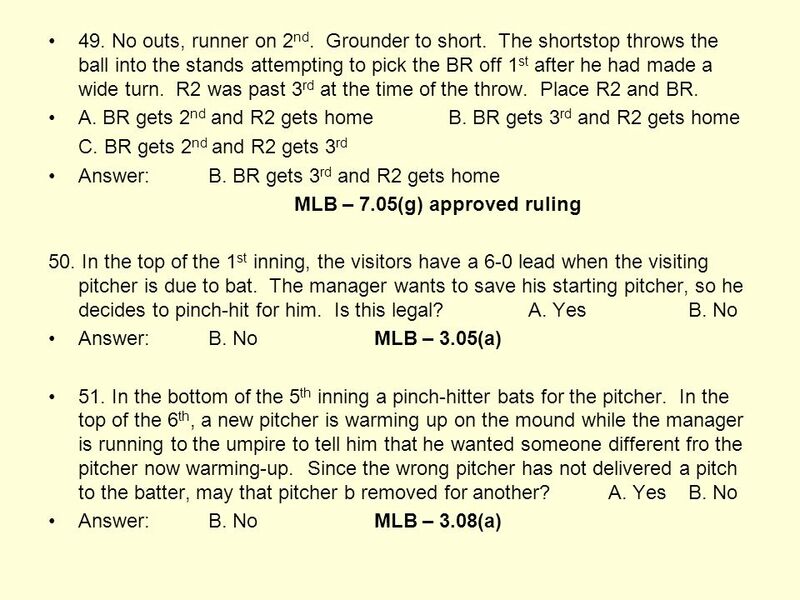 Umpire Rules Test (cont.) 29. runner on 2 nd attempts to steal 3 rd. The batter swings and nicks the pitch that is caught by the catcher, then steps backward. 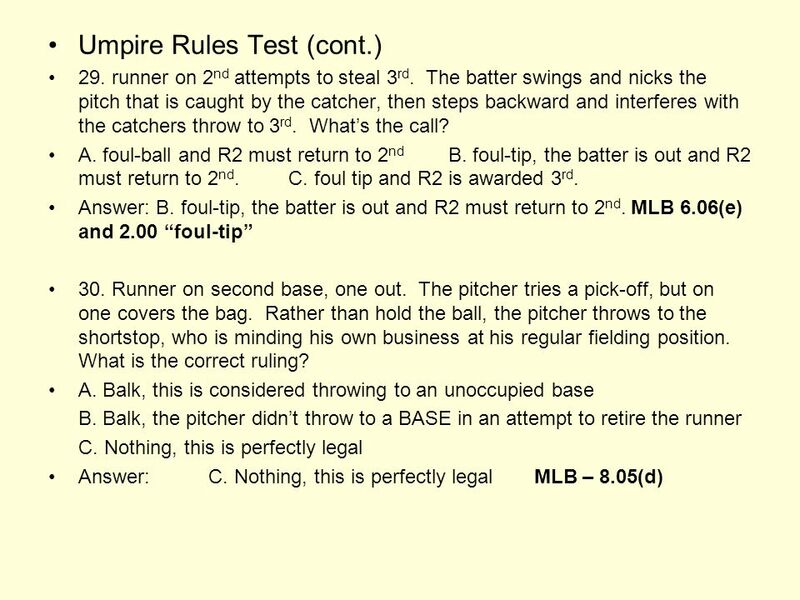 Download ppt "Umpire Rules Test (cont.) 29. runner on 2 nd attempts to steal 3 rd. The batter swings and nicks the pitch that is caught by the catcher, then steps backward." 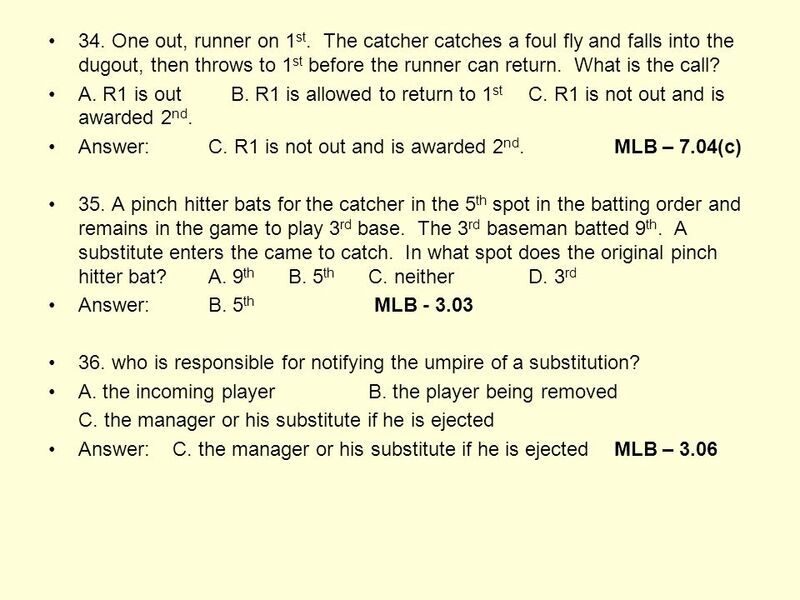 Fairfax Adult Softball 2011 Umpire Training Rule 8 - Batter-Runner and Runner. 1 4 MAN MECHANICS. 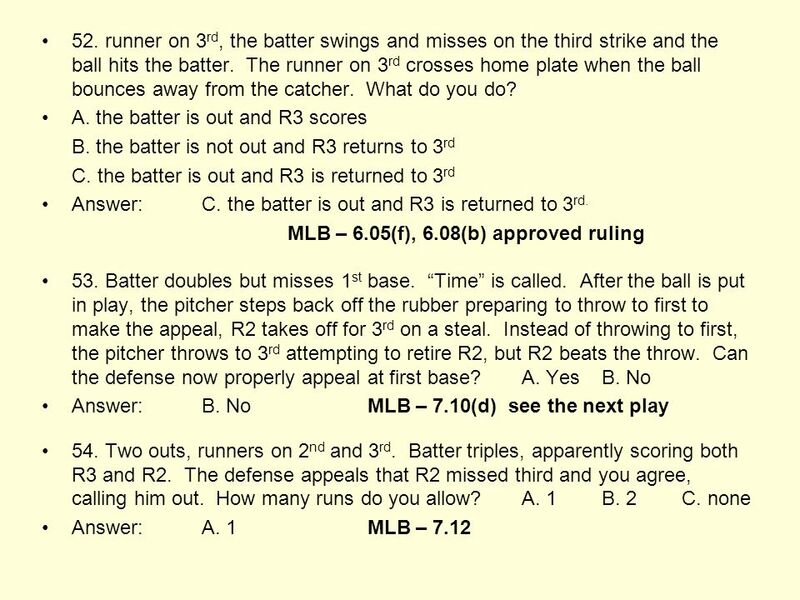 2 GENERAL PRINCIPLES In 4 man crew someone will ALWAYS go out on fly balls and once out stays out; Check swings appeals go to U1 on. Softball Rules Clinic Rules 5-8. 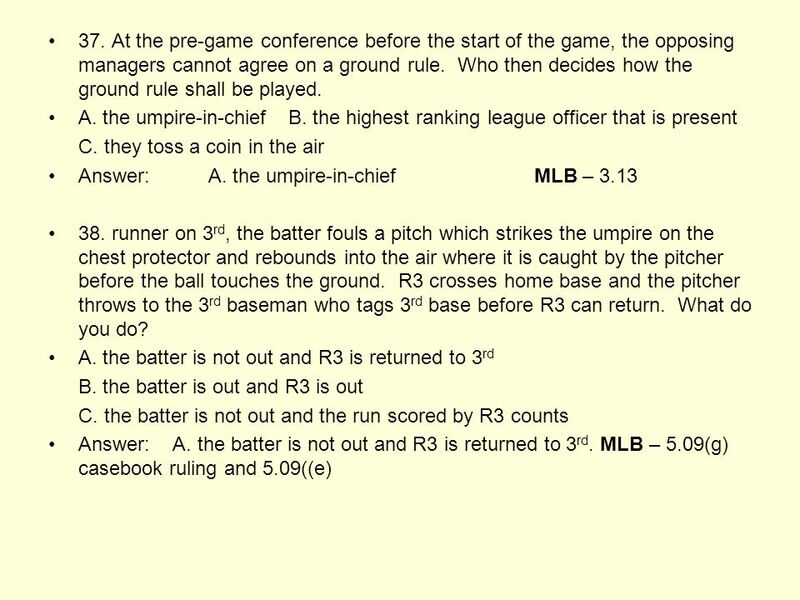 Umpire Test questions One out, runners at 2 nd and 3 rd. Batter hits a grounder to 3 rd baseman, who gets R3 in a rundown between home and 3 rd. NEMOA Baseball 2013 Baseball Umpire Training PowerPoint created by John Hickey, 2012 Baseball Training Presentation created by John Hickey. Will Curtis F7 F9 F5 F2 F3 D – Slot To the right of Shortstop D – Slot To the right of Shortstop B – Slot to the left of the Second base B – Slot to. Baserunning Awards. B1 hits a slow roller to F5 who makes no play. 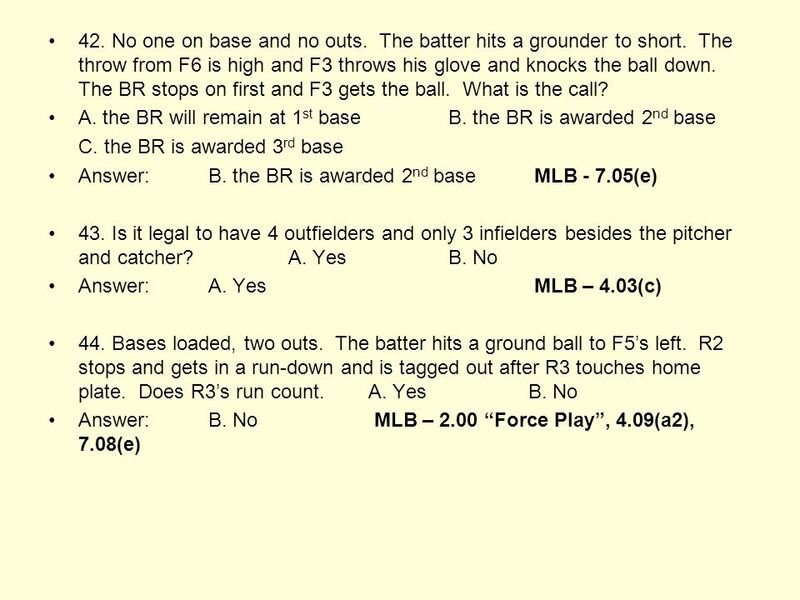 The batter –runner feints an attempt to go to second and F5’s subsequent throw goes. Western Piedmont Baseball Mechanics 3 2-Man. Mechanics 3 2-Man: Field Mechanics & Coverages No Runners On Base UIC: Move out on all batted balls; Ground. 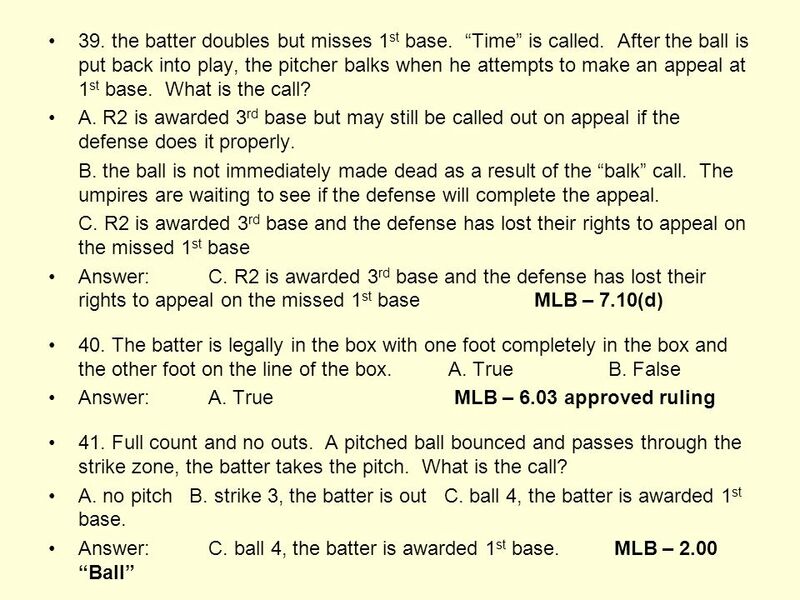 Fairfax Adult Softball 2010 Umpire Training ASA RULE 6 – Pitching Regulations ASA RULE 7 – Batting. Baseball Officials Training Day 3 North Texas Independent Sports Officials. 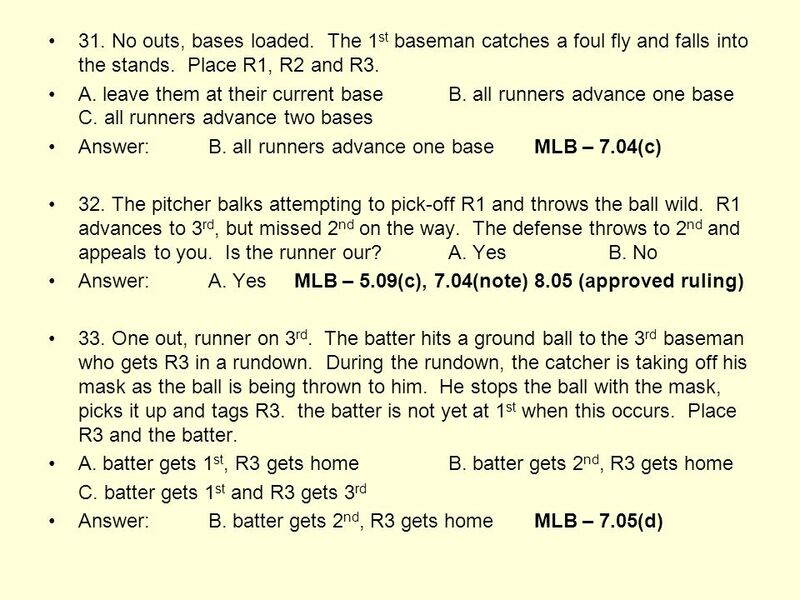 1 UMPIRE MECHANICS Theory of Proper Positioning “Angle is primary; distance is secondary; Closer is better, up to a point.” TEXAS BASEBALL UMPIRES ASSOCIATION. 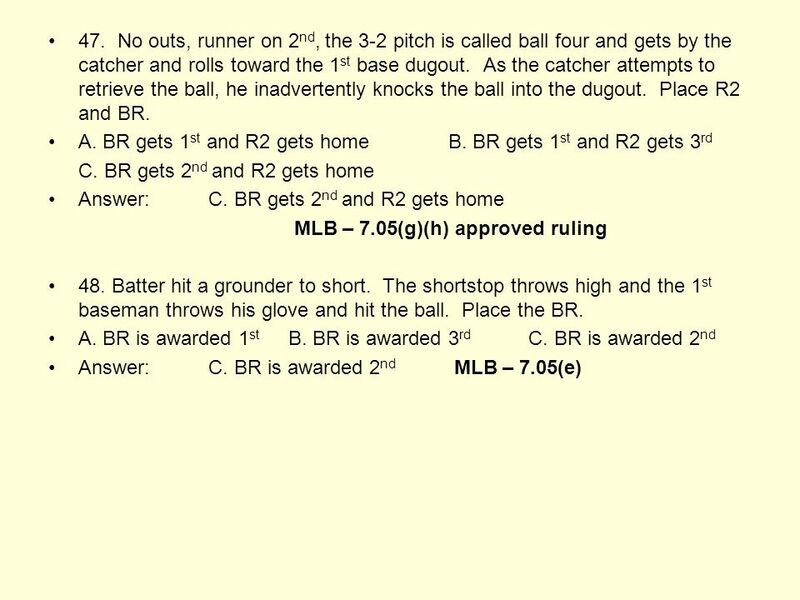 Western Piedmont Baseball Rule 7 Batting. 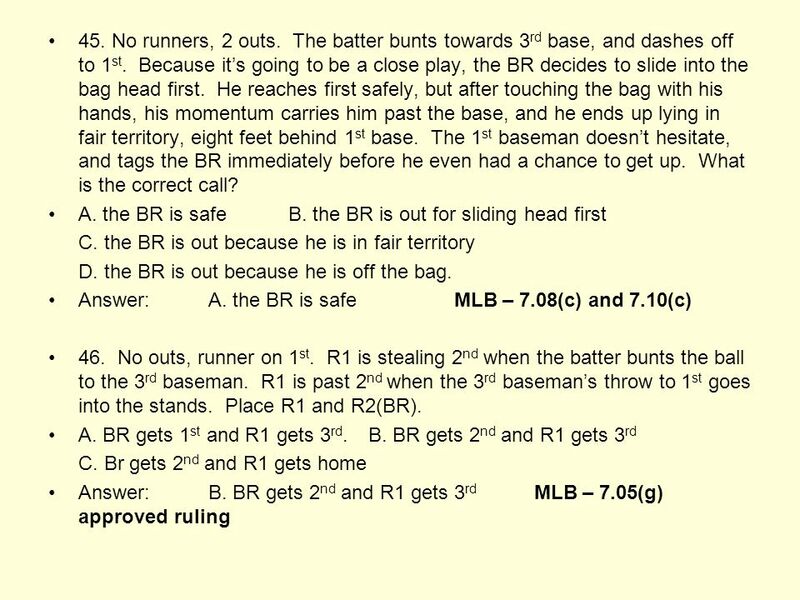 Rule 7 Batting Player becomes batter when he steps into a batter's box. Improper batter when out of order. Can.